We’d like to remind everyone to please chop your green. We’re happy to take your green from April first to October 15 in the garbage cans marked clean green. Only thing we ask is that you get as much soil off of it as possible and chop it. If you don’t have time to chop it, please either bury it on your plot, or take it to your yard waste at home. Also please don’t put green in the ‘brown woody waste’ area in the south area of the p-patch. This area is only for brown woody things that won’t work in our compost areas. If you have questions, please feel free to email the Bradner leads or the compost czar, Jim. If you have things on your plot that you need to dispose of, but don’t know how, let the Leads Team know and we can figure out how to help you. AS ALWAYS – If you have any questions, suggestions, or comments on our compost system or just want to know how it works, please don’t hesitate to drop us an email. We’d be happy to answer any questions you might have and hear your feedback. Thanks for all your help! 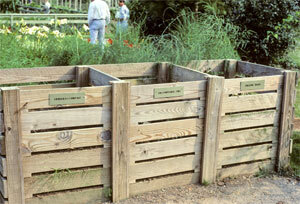 Your greens and composting are what make the garden go-round!